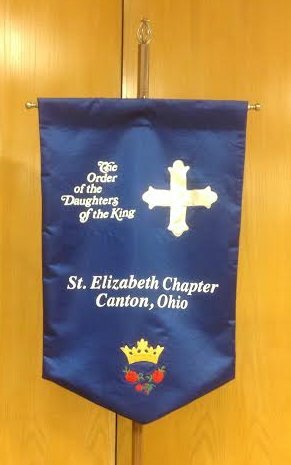 The St. Elizabeth Chapter of the Order of the Daughters of the King meets regularly, devoted to prayer and service. The 20 members provide hospitality regularly for parish events, and sponsor special Quiet Days of devotion. The Order of the Daughters of the King is a spiritual sisterhood of women dedicated to a life of Prayer, Service and Evangelism. We have made a commitment to Jesus as our Savior and we follow Him as Lord of our lives. We are an Order, not an organization, of women who are communicants of the Episcopal Church, churches in communion with it, or churches in the Historic Episcopate. This includes women in the Anglican, Episcopal, Lutheran and Roman Catholic Churches. We are under a religious rule requiring members to take life-long solemn vows to follow the Rule of Prayer and Rule of Service. Women wishing to become members undertake a period of study overseen by a mentor. When completed, they are inducted into our Chapter. This ceremony will take place on Christ the King Day where we welcome new members into our Chapter. Our Chapter is the Saint Elizabeth Chapter. Elizabeth of Hungary was a princess of the Kingdom of Hungary, Countess of Thuringia, Germany and a greatly venerated Catholic saint. She was married at the age of 14, and widowed at 20. After her husband’s death, she regained her dowry, using the money to build a hospital where she served the sick. She is probably best known for her miracle of the roses. While she was taking bread to the poor in secret, she was met by her husband and his hunting party. In order to quell the suspicions of the gentry that Elizabeth was stealing treasure from the castle, he asked her what was beneath her cloak. When she opened her cloak, a vision of red and white roses could be seen, which proved to her husband that God’s protecting hand was at work. Hers is the first of many miracles associated with Christian saints with roses. Therefore, the St. Elizabeth Chapter uses the crown, bread and rose as symbols related to St. Elizabeth. Linda Kendrick, President; Carol Sutek and Beth Paynter, Vice Presidents; Susan Phillips, Secretary; Marcia Enslen, Treasurer; Judy Arrington, Shirley Brown, Sally Davis, Wendy Johnson, Flo Myers, Brenda Maurer-Denning, Vicky Simpkins.